Who Ya Gonna Call???. 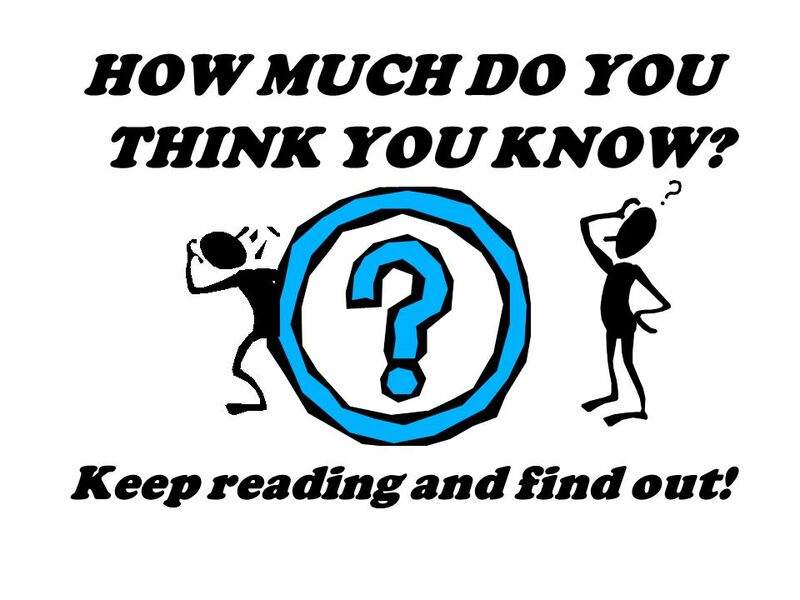 HOW MUCH DO YOU THINK YOU KNOW? Keep reading and find out! 1 Who Ya Gonna Call??? 3 HOW MUCH DO YOU THINK YOU KNOW? Keep reading and find out! 4 Does eating Turkey really make you sleepy? NO! 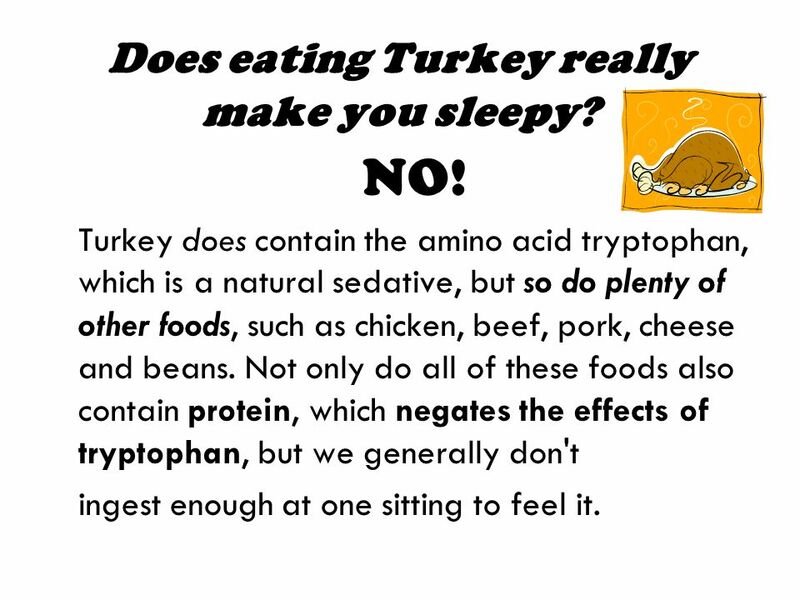 Turkey does contain the amino acid tryptophan, which is a natural sedative, but so do plenty of other foods, such as chicken, beef, pork, cheese and beans. Not only do all of these foods also contain protein, which negates the effects of tryptophan, but we generally don't ingest enough at one sitting to feel it. 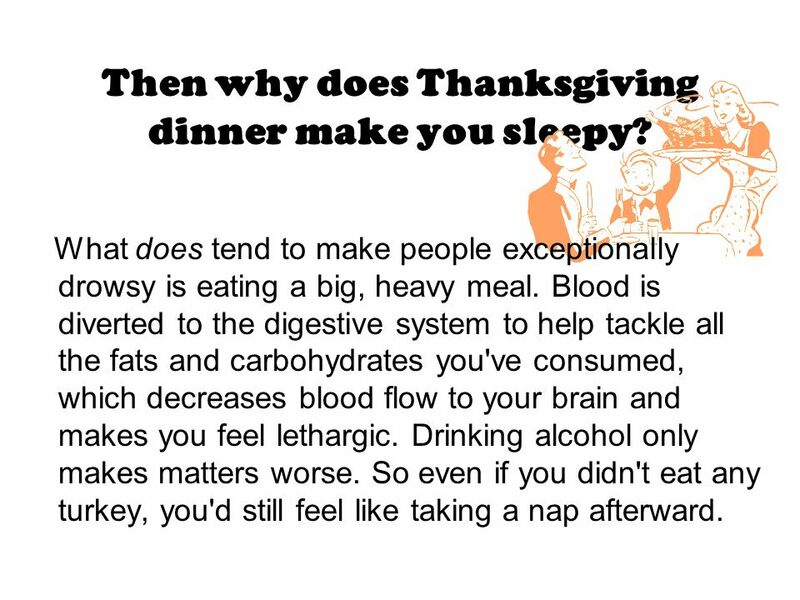 5 Then why does Thanksgiving dinner make you sleepy? What does tend to make people exceptionally drowsy is eating a big, heavy meal. Blood is diverted to the digestive system to help tackle all the fats and carbohydrates you've consumed, which decreases blood flow to your brain and makes you feel lethargic. Drinking alcohol only makes matters worse. So even if you didn't eat any turkey, you'd still feel like taking a nap afterward. 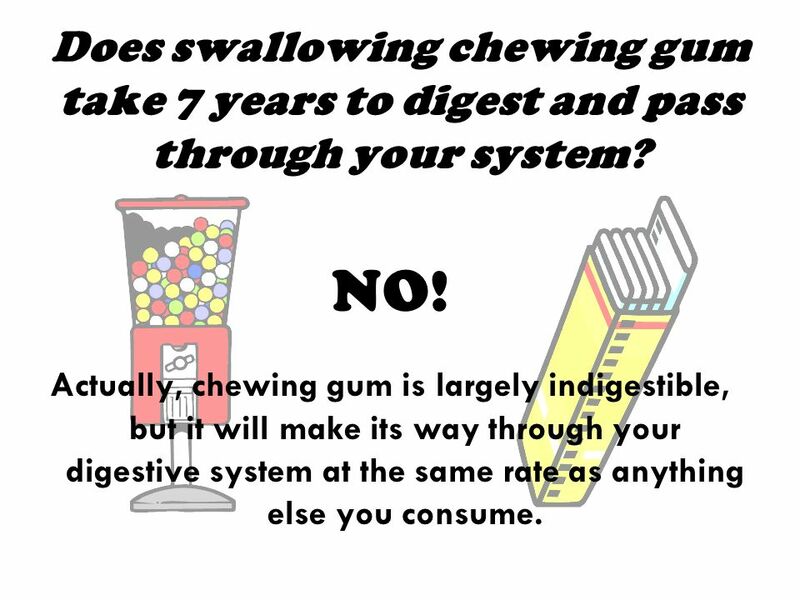 6 Does swallowing chewing gum take 7 years to digest and pass through your system? NO! Actually, chewing gum is largely indigestible, but it will make its way through your digestive system at the same rate as anything else you consume. 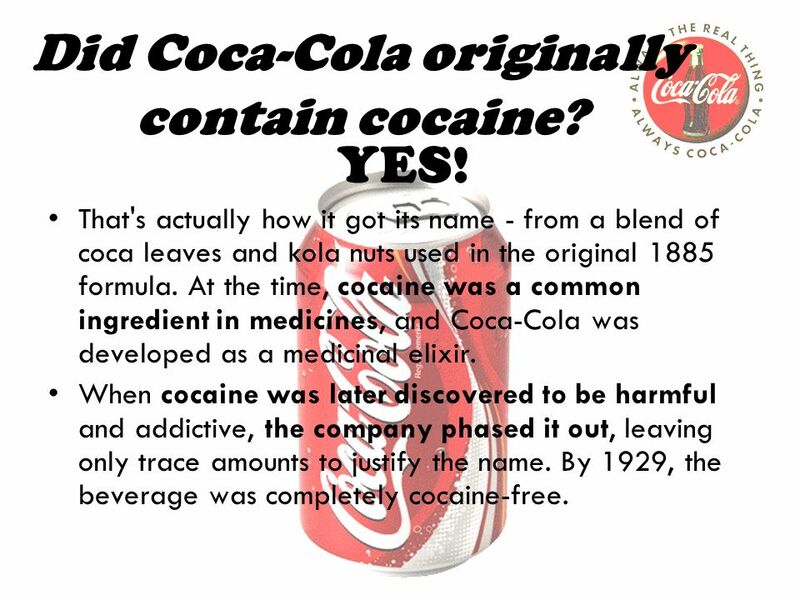 7 Did Coca-Cola originally contain cocaine? YES! That's actually how it got its name - from a blend of coca leaves and kola nuts used in the original 1885 formula. At the time, cocaine was a common ingredient in medicines, and Coca-Cola was developed as a medicinal elixir. When cocaine was later discovered to be harmful and addictive, the company phased it out, leaving only trace amounts to justify the name. By 1929, the beverage was completely cocaine-free. 8 Does eating chocolate cause acne breakouts? NO! 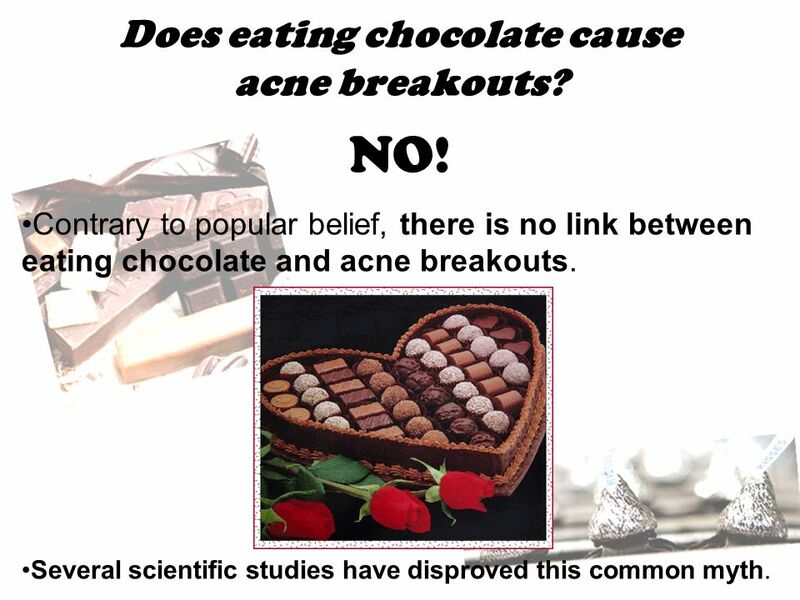 Contrary to popular belief, there is no link between eating chocolate and acne breakouts. Several scientific studies have disproved this common myth. 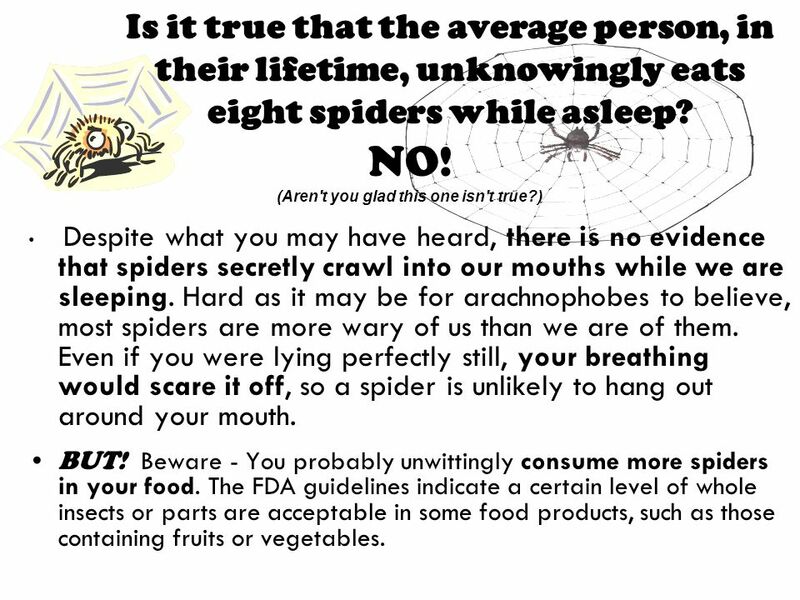 9 Is it true that the average person, in their lifetime, unknowingly eats eight spiders while asleep? NO! (Aren't you glad this one isn't true?) Despite what you may have heard, there is no evidence that spiders secretly crawl into our mouths while we are sleeping. Hard as it may be for arachnophobes to believe, most spiders are more wary of us than we are of them. Even if you were lying perfectly still, your breathing would scare it off, so a spider is unlikely to hang out around your mouth. BUT! Beware - You probably unwittingly consume more spiders in your food. The FDA guidelines indicate a certain level of whole insects or parts are acceptable in some food products, such as those containing fruits or vegetables. 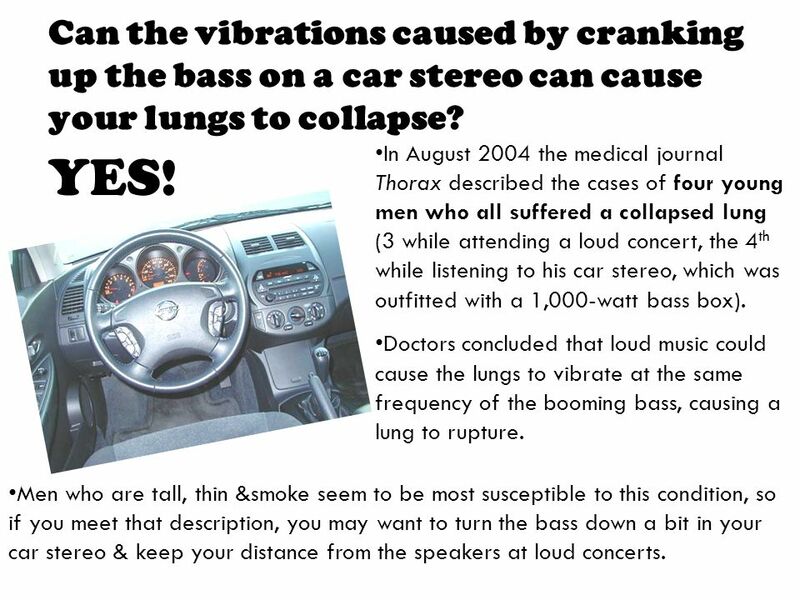 10 Can the vibrations caused by cranking up the bass on a car stereo can cause your lungs to collapse? YES! In August 2004 the medical journal Thorax described the cases of four young men who all suffered a collapsed lung (3 while attending a loud concert, the 4 th while listening to his car stereo, which was outfitted with a 1,000-watt bass box). Doctors concluded that loud music could cause the lungs to vibrate at the same frequency of the booming bass, causing a lung to rupture. Men who are tall, thin &smoke seem to be most susceptible to this condition, so if you meet that description, you may want to turn the bass down a bit in your car stereo & keep your distance from the speakers at loud concerts. 11 YES! 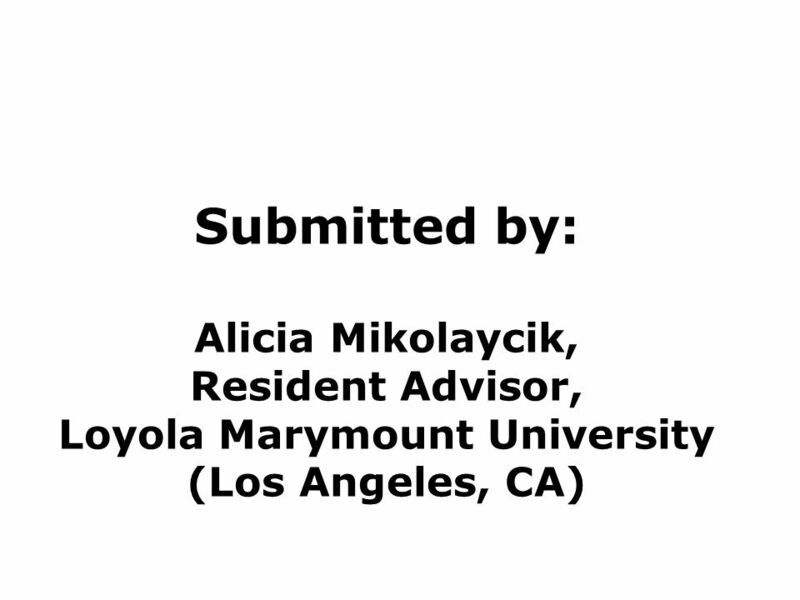 In two separate studies, engineering students at Purdue University and the U of Michigan designed a licking machine (wouldnt you love to see a photo?) to find the answer to the age-old question, "How many licks does it take to get to the center of a Tootsie Pop?" The Purdue machine averaged 364 licks, while Michigan's took an average of 411 licks. 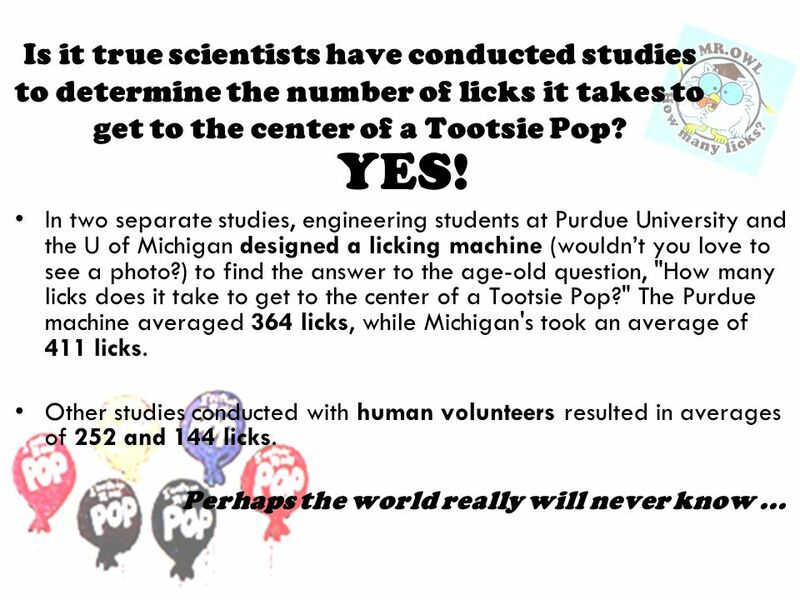 Other studies conducted with human volunteers resulted in averages of 252 and 144 licks. Perhaps the world really will never know... Is it true scientists have conducted studies to determine the number of licks it takes to get to the center of a Tootsie Pop? 12 Want to know MORE? 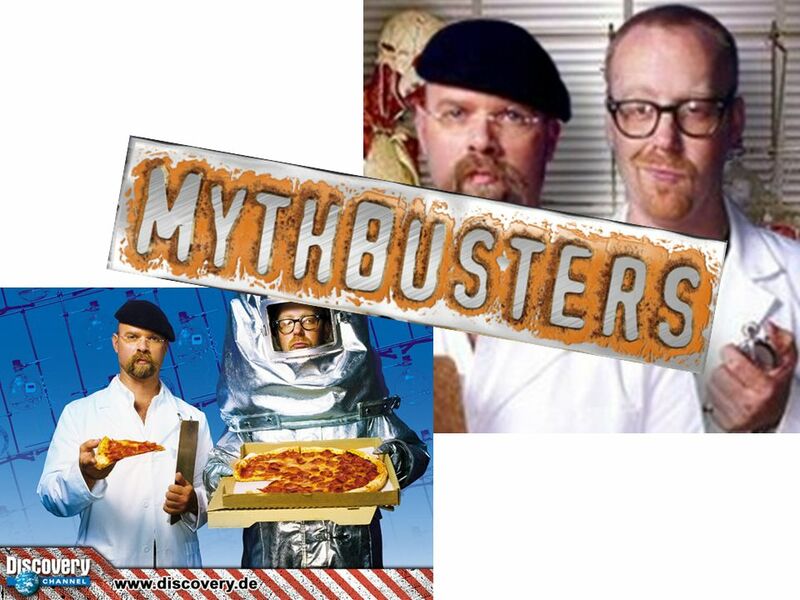 Log on to: http://dsc.discovery.com/fansites/mythbusters/mythbusters.html and start busting those myths!!! 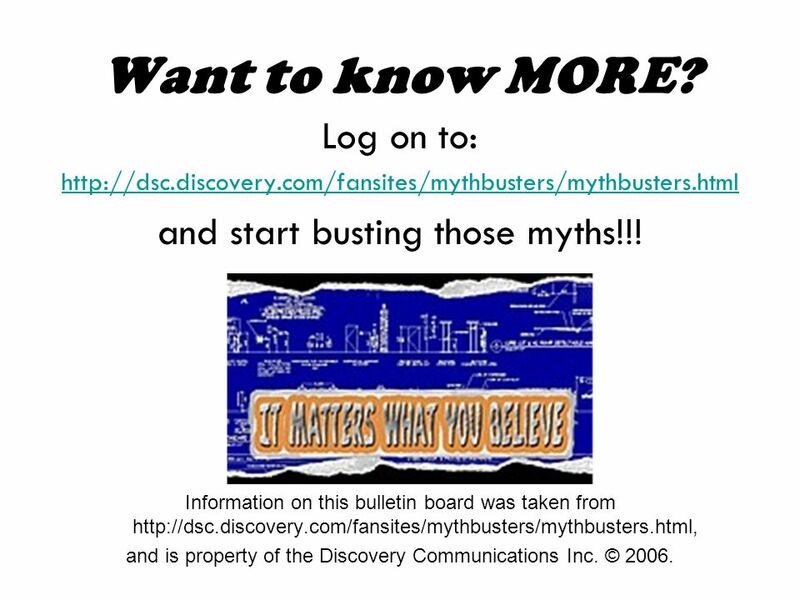 Information on this bulletin board was taken from http://dsc.discovery.com/fansites/mythbusters/mythbusters.html, and is property of the Discovery Communications Inc. © 2006. 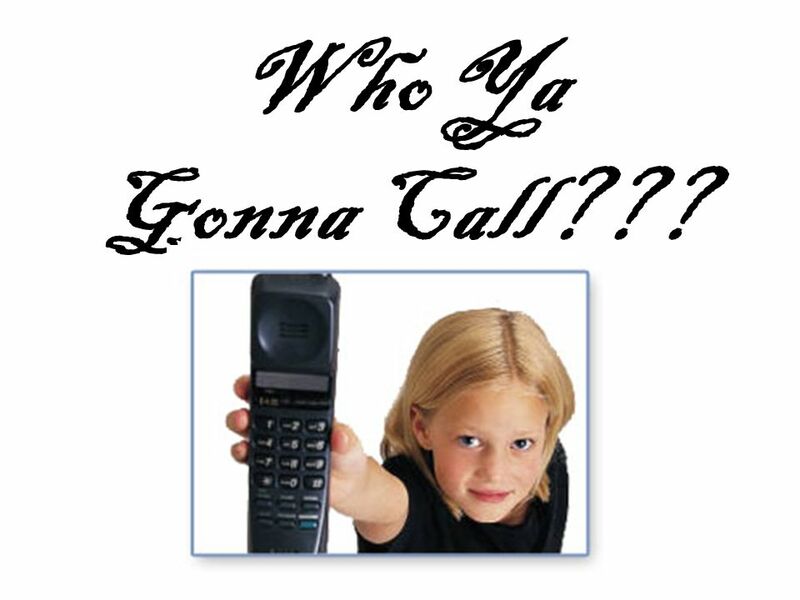 Download ppt "Who Ya Gonna Call???. HOW MUCH DO YOU THINK YOU KNOW? Keep reading and find out!" Z Z Z public parks on the beach on the job (at your own risk) any public transportation in the library at the gym (not in the pool!!) in your car (while. EPHEDRINE HCL REVIEWS & TESTIMONIAL S. Ephedrine is perhaps the most researched weight loss supplement on the market today. Over 100 clinical trials have. 7 DONT'S AFTER A MEAL. An interactive slideshow for the youth and adults of America. The Balance of Good Health. Is all FAT the same? Year 9 Wellbeing Survey The stark warning - in a major report in The Lancet medical journal - shows teenagers are doing worse than their predecessors. MAIN REASONS OF WEIGHT GAIN AND PRINCIPLES OF HEALTHY EATING.  DR. AMEENAH, INDIA. Catalyst 5/12/14  Write down and answer the following question on your Catalyst sheet:  What is the main difference between barbiturates and benzodiazepines? Nourish Your Mind: Eating for Improved Mood and Mental Health. HEALTHY AND UNHEALTHY WAYS TO LOSE WEIGHT! TECHNOLOGY AND YOUR HEALTH.